Huna is an esoteric Polynesian psychology that claims to use the powers of the mind to accomplish healing and spiritual development. 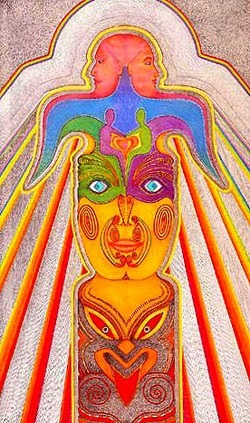 Max Freedom Long, who rediscovered Huna in the 1920s, defined it as a system of religious psychiatry because it contains elements of religion, psychology, and psychic science. Huna practitioners believe their teachings are ancient and sacred, although at least one writer has claimed they actually have modern origins. In the Hawaiian language, the word huna means “secret” or “that which is hidden,” referring to a tradition of hiding these teachings. The word is also said to be taken from kahuna,a priest or teacher who was the “keeper of the secret.” Huna has traditionally been passed on through oral communication and in chants rather than in writing. Huna was outlawed in the nineteenth century by Christian missionaries to the Hawaiian Islands. Max Freedom Long, who founded the Huna Fellowship in 1945, spent years decoding the language of Huna knowledge. He published eight books on Huna between the 1920s and his death in 1971. Serge Kahili King, a non-Polynesian kahuna, founded One Order of Huna International in 1973. The specific teachings and customs associated with Huna vary somewhat from island to island. All agree, however, on the concept of three spirits or minds in the human being. According to Huna, the complete being consists of a physical body inhabited by two of the three minds: the “low self” which is below the level of consciousness, and the “middle self” which is the conscious mind. The middle self is what others perceive as one’s personality. The third spirit or mind, the High Self, is outside the body. Each person has a transparent shadow body that completely duplicates the physical body. This shadow body is called the aka. The aka is like a pattern or blueprint that connects the three selves. It has a sticky and stretchy quality that allows it to form connections between an individual and another person or object. When someone touches, looks at, or even thinks of something, a thread or cord from the aka attaches to it, forming an energy channel between the person and another person or object. Illness develops when there is a conflict between the conscious mind and the patterns of the aka. The third mind or self, the High Self, is not God but a person’s divine connection with God. Ideally all three selves or minds in a person should be in continual contact with one another. The low self is the communication link between the middle self and the High Self. It obtains information directly from the senses and is the seat of the emotions. It has a limited ability to reason and reacts to events only on the basis of previous programming even if this programming has been incorrect or negative. Blockages in the low self caused by fear, anger, or negative programming interrupt communication with the High Self. The function of the kahuna is to remove these blocks. Kahunas use a wide range of techniques including telepathy, rituals, massage, body stroking, herbs, dream work to clear the mind of limiting beliefs and fears, meditative movements known as kalana hula, and a variety of other self-development techniques to establish harmony among people, objects, locations, and circumstances. An example of the latter is Ho’oponopono, which refers to counseling and mediation to balance relationships. The three minds or selves use a form of subtle energy called mana, which is stored in the aka. The low self takes energy from food and turns it into mana, or basic life energy. The kahunas, who serve as conduits for the healing qualities of mana, use breathing techniques to increase a person’s mana. The basic breathing technique involves drawing a deep breath, holding it, and willing the mana into a body part that needs healing, into the hands, or into an object like a crystal or talisman. A person’s mana is also increased by living correctly. Huna emphasizes the importance of living and speaking positively, and of doing no harm to others. Practitioners of Huna also emphasize that their way of life is accessible to everyone and can be practiced by everyone; that is, it does not depend on having unusual psychic gifts or on joining a small group of “chosen” initiates. All humans have the basic capacity to practice and benefit from Huna. As of 2000, Huna is considered an unproved therapy for major physical disorders and should not be used to the exclusion of proven medical treatments. Huna is said to promote general wellness, and should therefore be used only in conjunction with other healing methods in cases of potentially serious illness. There are no known physical side effects to Huna healing. The system’s emphasis on speaking only positive things, being of service to others, and not hurting others might well have beneficial side effects in a person’s life. In addition, the Huna Fellowship maintains that Huna does not require anyone to give up other religious affiliations or belief systems. This understanding minimizes the possibility of emotional stress caused by conflicting loyalties. The healing methods of Huna are unproved by medical research, although medical practitioners acknowledge that benefits may be achieved through a placebo effect. Training consists of brief courses (usually less than one week) offered in Hawaii and elsewhere. The methods can also be self-taught, using books, videos, and other teaching materials that can be obtained from Huna Research. Huna healers and teachers can be found in many countries of the world.